"With the flat bottoms these bags work great." COMMENTS: With the flat bottoms these bags work great, and are crisp and clear. Depending on how sealing it, it could look real professional. COMMENTS: Great size for bath salts. Very convenient. COMMENTS: Love this for my bath salts!! Work Great! COMMENTS: These bags are the perfect size for my large cupcake bath bombs! Also great for little guest soaps and mini bath bombs! COMMENTS: Great way to package dry products and product sets. Also use for "refill" packaging for dry products for customers who already have a container at home. COMMENTS: Easy to use. Looks great and polished with a few curly ribbons and a tag. COMMENTS: I ordered these because the picture shows that they sit flat, like a lunch sack, thinking that's what they did, but they don't sit flat until you fill them. I need the lunch sack style to package my soapy cupcakes because these rub against the soap and leave soap marks on the inside of the bag. 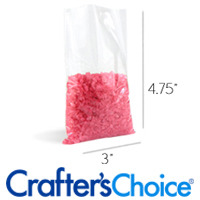 COMMENTS: These bags are perfect for holding bath salts, soaps, bath bombs or anything else you want to package. I really prefer the gusset bags since they can stand up by themselves when filled and have a much classier/professional look than the flat bags. COMMENTS: The first time I ordered the wrong size then got these and they were the perfect size to fit 6 one ounce sized wax tarts with room to tie the bag. Will order these again. "Holds more (volume) than I thought"
COMMENTS: Good quality. The bags are true to dimensions, but they hold more volume than I thought. COMMENTS: I got these in a kit and they work great for my bath bombs, cookies, and salts. COMMENTS: I needed something to package some shower fizzies for Christmas gifts ... These worked great. Just the right size for 8 fizzies and they're easy to seal ... I just folded down the tops and taped them. COMMENTS: I have average rating because I think its not reasonable for 30 bags only. And I just cant find it anywhere else so im glad i found it here. COMMENTS: These bags work great for packaging my large loaf slices. I tie them off above the soap and it looks great. I have found that the poly material is more flexible than the cello bag material. COMMENTS: These bags fit the dog bone soaps perfectly. They are heavy duty and look cute with a label and raffia. COMMENTS: I use these to package all my bath bombs and small soaps. I simply tie a piece of raffia around the top and am done! "Works great with bath salts"
COMMENTS: Used these for bath salts and they held up well. Salt looked great in the bag. COMMENTS: these bags work great for just about everything, love them! 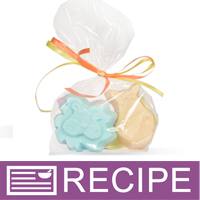 COMMENTS: These bags are the perfect size for my soaps, I tie a string around to decorate and tie closed. They look very nice! "How much bath salts cups or oz. a bag this size hold?" Staff Answer Typically when packaging these for sale we recommend no more than 2 cups of product just for the appeal of the packaging. 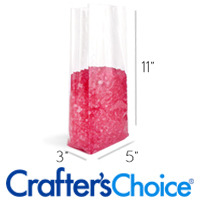 However, you can most likely fit up to 4 cups of salts in this bag and still be able to seal it. "Do these bags have a large seam in the middle of one side, like the crystal cello gusseted bags?" Staff Answer Yes they do. "I would like to use these for bath salts. 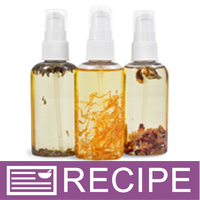 Is it okay to use essential and/or fragrance oils in the bath salts, or will it eat away at the bag? Thanks!" 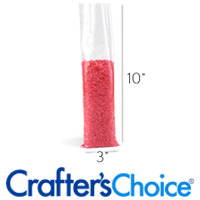 these are awesome for bath salts! the bags are crystal clear and you end up with a really professional looking product. make sure your salts are 100% dry before bagging them though because if the fragrance oil is still moist it could possibly damage the bags, but otherwise go for it!